A call to Alan Leigh at International Yacht Collection confirms that he's closed on the sale of the 40.2m motor yacht Mirage, listed by Dennis DeLong at The Yacht Brokerage. Built by Heesen in 1992, Mirage remains one of the fastest yachts of her size in the world today – her triple MTU engines and waterjets propel her to speeds in excess of 35 knots. She was designed by Frank Mulder, with exterior styling by the late Gerhardt Gilgenast and an interior by Art-Line. 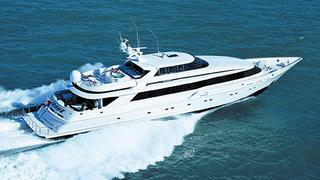 Mirage sleeps 10 guests in a main deck master, two doubles and two twin staterooms. Mirage was asking $3.4 million.